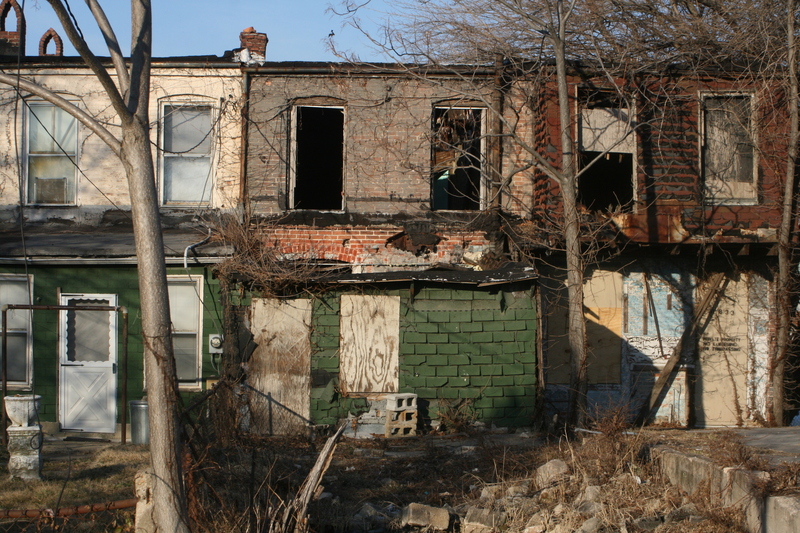 In postindustrial Baltimore, low-income residents are treated as expendable — and public services are slashed accordingly. Last week, the East Coast was hit by a “bomb cyclone.” Cities from Virginia to Maine were pummeled with a devastating combination of blistering ice, snow, flooding, and winds. While the storm significantly hampered students’ ability to get to school across the Eastern seaboard, in the case of over sixty Baltimore public schools the problem wasn’t getting them to school, but rather keeping them warm in school. A Baltimore teacher posted a picture of children huddled, freezing, in full winter gear, and the picture soon went viral. Staff in some sixty schools (one-third of the city’s total) had significant heating issues. In response, the school system and local political officials pointed the finger at the state and at Republican governor Larry Hogan, while Hogan pointed the finger at the city and the school system, suggesting that graft and malfeasance were the real reasons why children (the vast majority of whom are black and lower income) were forced to endure frigid classrooms. One enterprising Coppin State student created a GoFundMe campaign to provide schools with heating units. The effort has raised over $80,000, quadruple the amount requested. Dozens of parents and concerned citizens packed a school board meeting this week. Local Baltimore residents and pundits understand this as a political crisis, and to an extent they’re right. Children are the city’s most vulnerable population and represent the best hope for its future. Under no circumstances should they be forced to suffer the way they did last week. Furthermore, in as much as the Baltimore City Schools are cash strapped, residents also see this as an economic crisis that is tinged with racism — and to an extent they’re right here as well. Last year the school system laid off dozens of teachers and staff, and shuttered several schools in order to deal with a $130 million budget shortfall. It is very difficult to imagine something comparable happening to white schoolchildren. But this common sense understanding also masks a larger set of issues tied to development priorities, conceptions of the public, and class. Since political officials, city planners, and economic elites began developing Baltimore’s Inner Harbor in the 1970s — kicking off the modern wave of downtown tourist development — at least $3.7 billion in public money (in the form of direct subsidies, tax write-offs, PILOTS or payments in lieu of taxes, and TIFs or tax increment financing) has been used for downtown development. More than Baltimore’s entire 2017 budget ($2.8 billion), this figure includes the recent decision to give Under Armour $600 million in TIFs, but also the construction of Camden Yards (home to the Orioles), M&T Bank Stadium (home to the Ravens), Harbor East, and dozens of other developments. In addition to using public funds for private purposes, the city has moved to privatize a range of public services. Again this has hit young residents especially hard. Over the past fifteen years Baltimore has transferred over two dozen recreation centers into private hands, and has outsourced much of its parks and recreation services to a nonprofit foundation. The successful push a few years ago by a coterie of activist teachers, parents, students, and residents to boost state spending on public school infrastructure has been the anomaly. Seemingly everywhere else there’s been decreased support for public goods and, on top of that, scant attention to accountability mechanisms and transparency — a phenomenon that partially explains charges of corruption in school spending. These dynamics are undoubtedly racially tinged. Baltimore was the first city in the country to pass legislation mandating racial segregation, and even after the Supreme Court found this move unconstitutional, city residents and political leaders found ways to circumvent the ruling. The federal government’s infamous “redlining” process — wherein maps were produced to mark which neighborhoods were “risky” for mortgage lending — was particularly useful for enforcing segregation. In fact, if you layered the redline map over present-day Baltimore you’d find a great deal of overlap, with many of Baltimore’s most distressed neighborhoods (including the neighborhood where Freddie Gray was born and died) in deep rouge. But what we’re witnessing in Baltimore is not so much a racial dynamic as a race and class dynamic, with the school system increasingly serving neighborhoods that are both majority black and majority poor. And while some may posit that this is simply another iteration of “the New Jim Crow,” this dynamic takes on a different tenor as Baltimore transitions from an industrial city designed to bring together industrial capital and labor, to a postindustrial city designed to bring together financial services, development capital, universities, and health systems. In contemporary Baltimore, black (and white) lower-income residents do not serve as an exploited labor population as such because the city’s economy no longer has a place for their labor. Rather, they serve as a population that needs to be cordoned off and controlled. Indeed, even as the city faced a fiscal crisis, Baltimore business owners implored political officials not to slash police spending. While the spectacular image of freezing Baltimore schoolchildren mobilized dozens of residents and parents to crowd the school board meeting this week, less spectacular dynamics compel teachers to spend upwards of $400 a year out of their own pockets on school supplies, force principals to cut library staff to make ends meet, place students under the surveillance of school police officers, push residents to turn to charity rather than the state to provide infrastructure support, and reduce the power of Baltimore residents to shape the destiny of their city. With this all in sight, we can not only understand why Baltimore children were left shivering in their schools, but we can see this incident as part of a longer history of what could be called economic violence. Economic violence that can and should be contested.